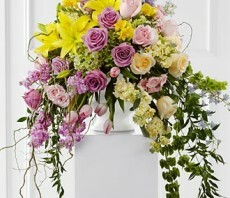 The Display of Affection Arrangement is an exquisite way to commemorate the life of the deceased. Lavender roses, yellow stock, pink stock, pink tulips, yellow roses, pink roses, pink spray roses, lavender larkspur, Bells of Ireland, yellow freesia, yellow Asiatic lilies, blue delphinium, green hydrangea and lush greens are accented with curly willow branches and arranged to create a sophisticated display that radiates elegance and grace at their final farewell service. 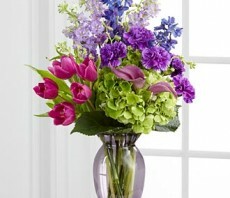 SMALL arrangement includes 54 stems, Approximately 36"H x 24"W. MEDIUM arrangement includes 67 stems. 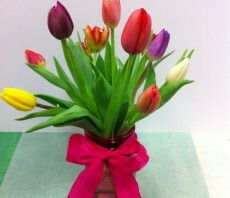 Approximately 38"H x 25"W. LARGE arrangement includes 82 stems. Approximately 40"H x 26"W.
The Immortal Casket Spray offers soft beauty and blushing comfort to honor the life of the deceased. 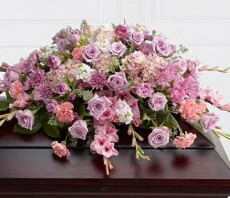 Lavender roses, chrysanthemums and parrot tulips are elegantly arranged amongst pink carnations, gladiolus, stock, hydrangea and lush greens to create a presentation, intended to bedeck the top of the casket, that evokes sweet memories of your loved one for their final farewell service. Approximately 38"W x 28"D.